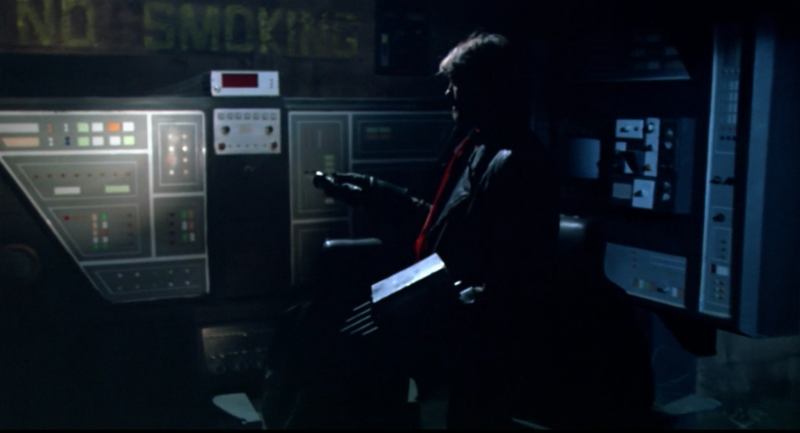 The film begins with text helpfully scrolling up the screen, accompanied by a man with a British accent even more helpfully reading the same text, without which the viewer would be completely lost. According to the titles, the earth was ravaged by nuclear war in 2015. The devastation led to the time period of the second human race, who live underground. Then a third group of humans decides to live above ground like their ancient ancestors, perhaps a clever reference to H. G. Wells' The Time Machine. We begin the story proper above ground, where after 225 years the desert is littered with well-preserved skeletons of the first human race, not to mention working vans, jeeps, and military hardware. We follow a well-armed band of motorcyclists who enjoy invading empty towns, criticizing architecture, and searching for rats to eat. In the back room of a saloon, our friends find green boxes full of canned food and bags of sugar. 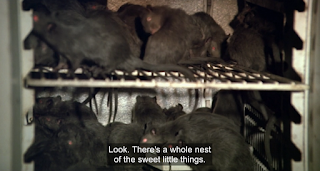 They dig in, eating everything, some of them even relieved they don't have to eat more rats. They have the strongest positive reaction to finding, of all things, flour, as they dump it on the only black woman in the group, whose name of course is Chocolate. Delighted, she says, "Look! I'm all white! I'm whiter than all of you!" 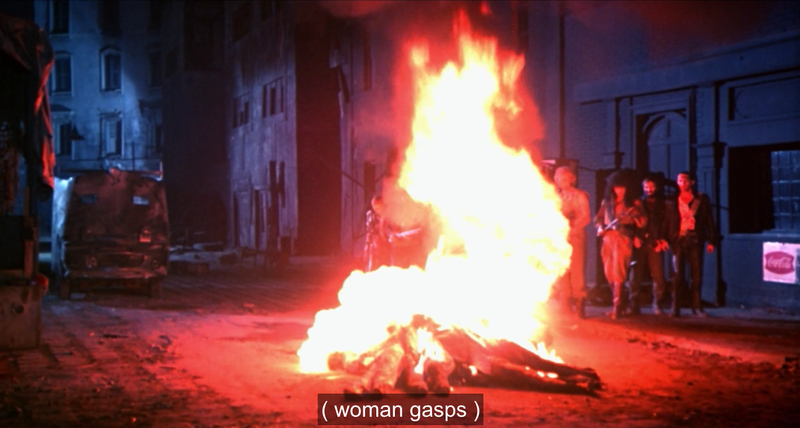 Chocolate is played by actress Geretta Geretta, famous from David Worth’s Warrior of the Lost World (1983), Lamberto Bava’s Demons (1985), and Lucio Fulci’s Murderock (1984). They conclude that they have found paradise, as would anyone in their situation happening upon sugar and flour. But perhaps paradise is not so easy to find. 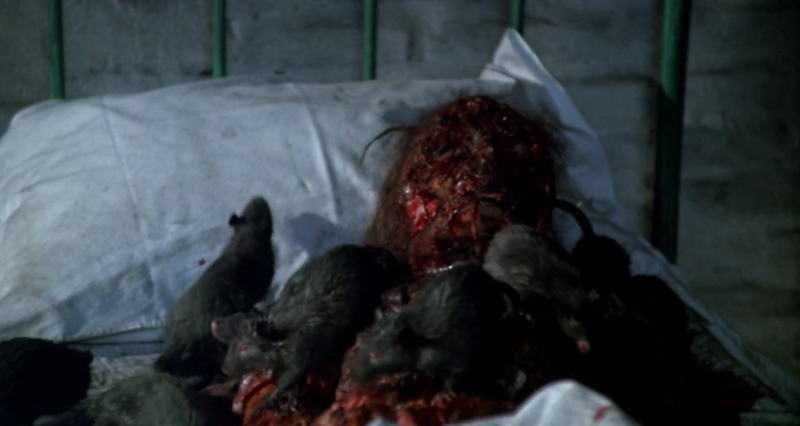 Investigating a nearby bed in an infirmary, a blonde woman finds a scene less appetizing than sugar and flour: a corpse being devoured by rats. For some viewers, the next scene might be too disturbing. One of the band, finding a rat on the saloon bar, flings a glass mug at the poor rodent, sending it flying off the bar. 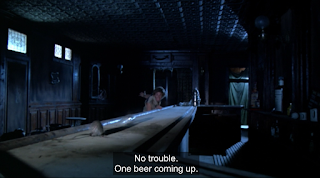 In this scene, the film signals that it will honor no taboos, not even disturbing helpless animals resting on bars. The night of terror begins. 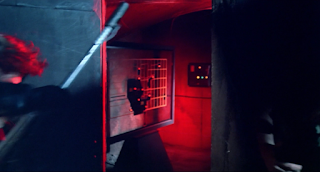 When night falls, after much good-natured tomfoolery involving rats and more rotting corpses, the band stumbles upon a room with advanced technology that can only be described as "sweet." The man named Video announces that he understands technology and he can show the rest of his friends how this machinery works. Chocolate, skeptical of his technological prowess, says, "I'll make you pregnant if you can make that thing work." Video manages to turn on the device. The leader tells him, "This isn't a video game. It's a computer." The computer screen flashes "TOTAL ELIMINATION GROUP." 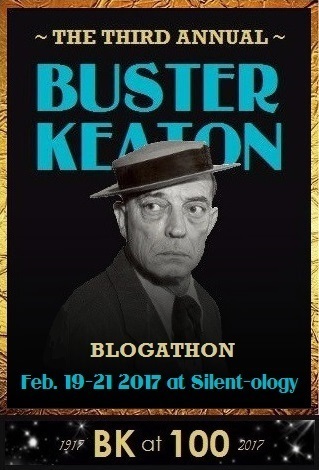 Our band of survivors wonders what it could mean when they are interrupted by another of their friends, who announces the cellar is full of strange and wonderful things. In fact, the cellar contains a water purifier--technology with which the punks are familiar--and hydroponically grown flowers. Our heros infer that the people responsible for the technology are now the corpses in the beds upstairs. Naturally, the first step is to burn all the rat-nibbled bodies. Then the punks go to sleep on the infirmary beds that recently housed the rotting corpses. 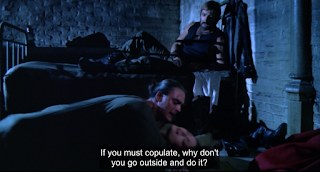 Suspense is ratcheted up when a couple making love in a sleeping bag is repeatedly cajoled and harassed until they leave the bunker. "If you must copulate," one of their comrades says, "why don't you go outside and do it?" Comedy ensues when the couple attempts to slip out of the sleeping bag, only to find the zipper stuck. Their friends playfully rib them for several minutes until one of them manages to unstick the zipper. The couple retreats to another room rather than leaving the building. When they are done making love, the man, Lucifer, walks to the barroom to smash some bottles while the woman, Lilith, forgetfully zips herself back into the sleeping bag. Meanwhile, in the basement, bearded punk Noah discovers rats dropping through pipes into the tank of the water purifier. 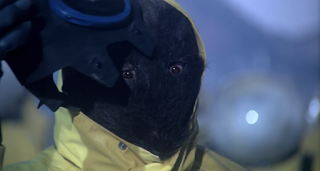 He unwisely stands under one of the pipes and is deluged with large gray rats. 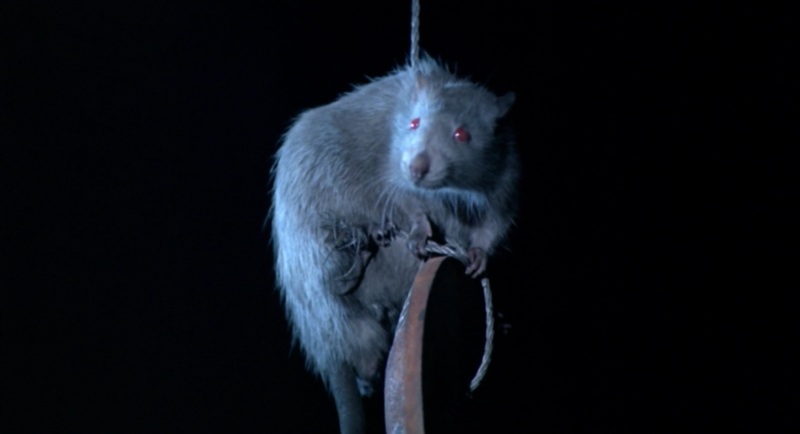 I must confess I do not completely understand what occurs with Lucifer in the next scene, but such is one of the many charms of Rats: Night of Terror. Lucifer manages to open a sewer grate and insert himself into the opening, facing upward for no apparent reason, while rats rain down on him. Meanwhile, Lucifer's girlfriend Lilith, trapped in the defective sleeping bag, is attacked by a single rat that burrows into the bag. Her screams draw the attention of her friends, but they are too late. She is dead, and of course the others believe Lucifer murdered her. "There's only one answer. He strangled her in his passion." "Look at her eyes!" one of the women says. "They're full of terror!" But then the truth emerges, and so does a rat. From Lilith's mouth. The night of terror begins in earnest. 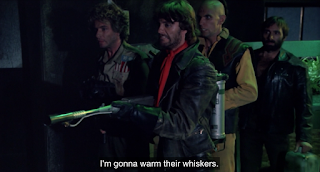 Fortunately, the gang has a flamethrower, which they use to kill one of their own who is being attacked by rates. They also have access to a shotgun, which they use to fire upward at the tops of buildings, despite the lack of evidence that rats are anywhere near the tops of the buildings. They search the building, opening the door to the computer room. There is the sound of an explosion, then the sound of rats squealing. "It's filled with rats!" proclaims the punks' leader Kurt, but here the film shows its subtle side, as we see no rats inside, only an empty room. Are we meant to question the existence of the rats? In a tense scene, a punk named Duke questions Kurt's leadership and challenges him to a duel to become leader of the group. 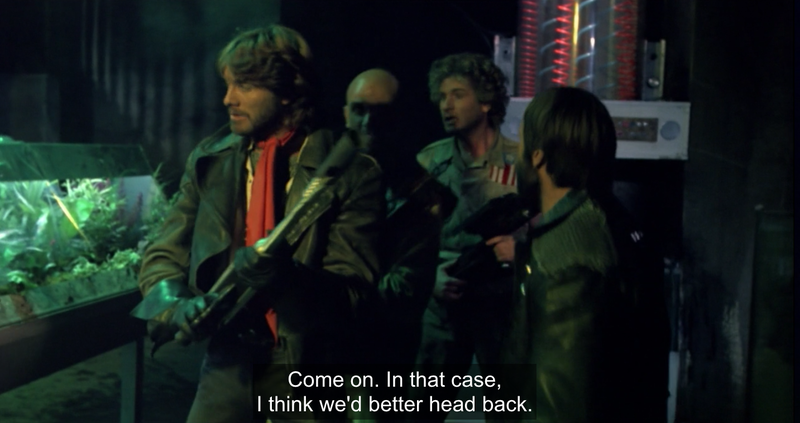 The duel consists of facing each other with weapons drawn for several minutes. Duke backs down by lowering his shotgun. 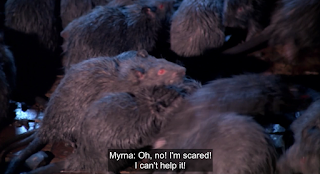 The gang realizes that they are "human beings, with human intelligence, not rats." They barricade themselves into a room, but they forget to close off an open window, a fateful mistake. The rats swarm inside. The punks fire shotguns through the window, but then they forget, again, to barricade the opening. Kurt has another confrontation with Duke. "If everything you're doing is calculated to make me mad, you're succeeding!" Kurt pushes Duke away, then takes a group down to the cellar we were told was rat-infested to get some water, which we have seen is rat-infested. When the smaller group discovers rats in the water, they decide immediately to give up and return upstairs. But of course, our heroes have a flamethrower and they see no issues with setting the wooden stairs to the basement on fire to kill a few rats. Unfortunately, the flamethrower doesn't work, so Kurt lights a makeshift torch and climbs the steps. "The fire keeps them at bay," he says, but we see no evidence of this as the rats simply sit harmlessly on the steps as the punks climb up. They all escape the basement except for Taurus, who makes the mistake of sitting down. He is overpowered by the rats and the others are helpless to save him. 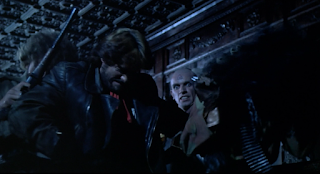 The tension grows again when Duke, who has stayed upstairs with the women, refuses to let Kurt and his group back into the safety of the infirmary. "Open the door! I order you to open it in the name of humanity!" The situation is quickly resolved through a clever ruse worthy of a Scooby-Doo or Three Stooges cartoon: Chocolate pretends a rat has entered the infirmary, which scares the rattled Myrna so much she stumbles into Duke, knocking him down. 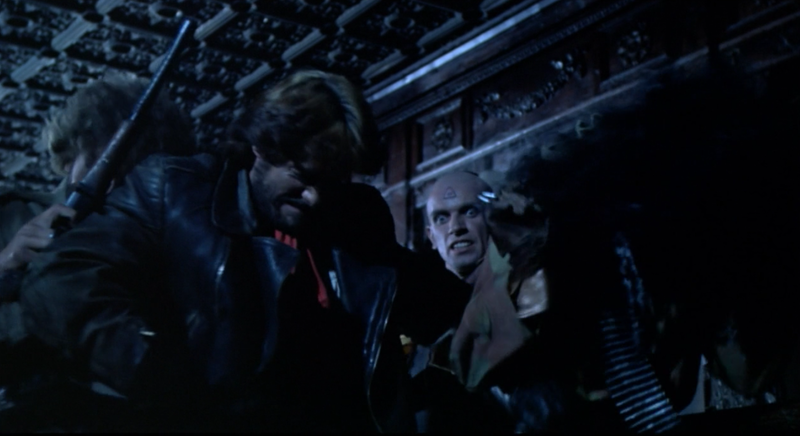 Once the women have the upper hand, they force Duke to get up and open the door--women, of course, being incapable of opening such a heavy door. 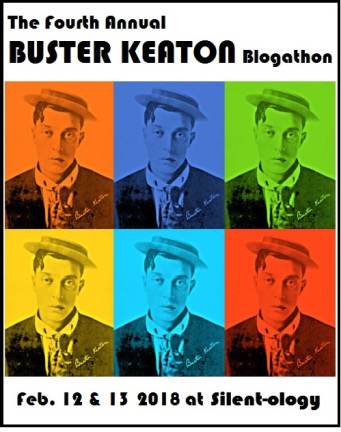 After Kurt calls Duke a swine several times, he kicks the mutineer in the groin, sparing the man's life due to Myrna's (some might say inexplicable) begging for Duke's life. After the confrontation, the film moves into its third act. Kurt decides to go outside alone, reasoning that the rats can't be smart enough to be tricking the humans into going outside. "I'll call their bluff, and I'll do it alone." Clearly, the rats are smart enough to bluff that they are smart enough to trick their victims into leaving the safety of the building. As in Hitchcock's The Birds, the survivors walk slowly outside as the rats surround them. Inexplicably, and contrary to his previous statement, Kurt is not the first to venture outside. It is Video who carefully steps around the clusters of rats. When he makes it a few hundred feet without incident, he concludes, "The war is over! Yahoo!" Then the inevitable occurs: The rats become slightly agitated for no apparent reason. The punks panic, running away and leaving Kurt on the other side of a few clusters of agitated rats. The film shows a rat sitting on some kind of disc hanging from a rope, implying that the rats have devised a Rube Goldbergian trap, but the trap never comes to fruition and the punks simply walk away. 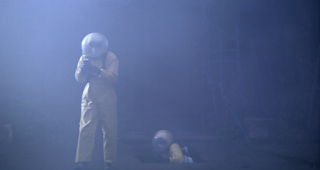 In one of the film's highlights, Kurt finds the body of Taurus, which bulges and then explodes with rats--which had apparently rigged some kind of powder-based explosive inside Taurus's body. The film's complex mutiny subplot is concluded neatly when Duke uses a grenade to blow himself and Myrna to pieces, a side effect of dropping said grenade into a container full of rats. Continuing the suicide theme, the injured Diana conveniently finds a razor blade lying on the floor and slices her wrist, preferring to control her own death rather than leaving it in the paws of the rats. When Kurt finds Diana's body, for good measure, one presumes, he fires his shotgun into her stomach to kill the rats congregating around her. In another nod to The Birds, and one the survivors might have foreseen, a pile of rats tumbles out of an open fireplace to attack. The four remaining punks can only barricade themselves in the computer room, where they find a recording device. The long-dead recorded voice explains that scientists were working on a way to make the surface world safe, but they were thwarted by a species thought extinct: the rat. "Never before has a creature so small hunted man," the voice says, "as once he hunted for food in the forests of our history." The voice goes on to breathlessly say, "The rats disappeared for several years down there, and we all assumed that they had died out. What had happened was that they had taken man's place on the outside, suffered from exposure to radiation, strengthened from it, and returned to claim their territory." Just when everything seems lost, the film has another surprise up its sleeve. We watch, shocked, as men in gas masks and yellow suits emerge from holes and begin spraying the area with hand-held fog machines. Meanwhile, in the computer room, the rats mount a final assault, breaking down a door and pouring in as if tossed by some off-screen hand. The finale echoes Dawn of the Dead (1978), as a near-murder/suicide is interrupted by second thoughts. 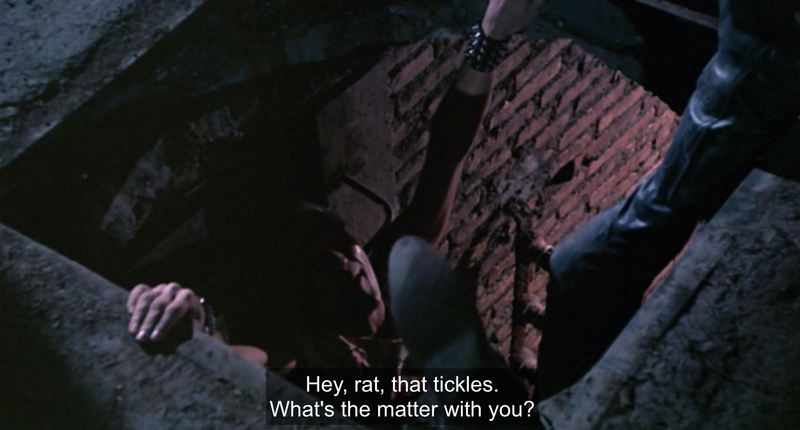 The two surviving punks are surprised to find that the rats have gone away, but ironically the gas that drove the rats away overcomes the punks. 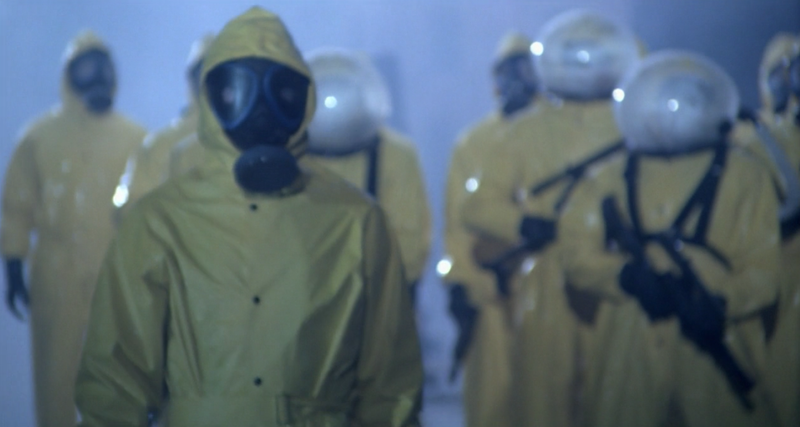 They awake, surrounded by the men in gas masks. In the end, the audience realizes that the filmmakers will end on a final irony, and our heroes have not received the rescue for which they were hoping. 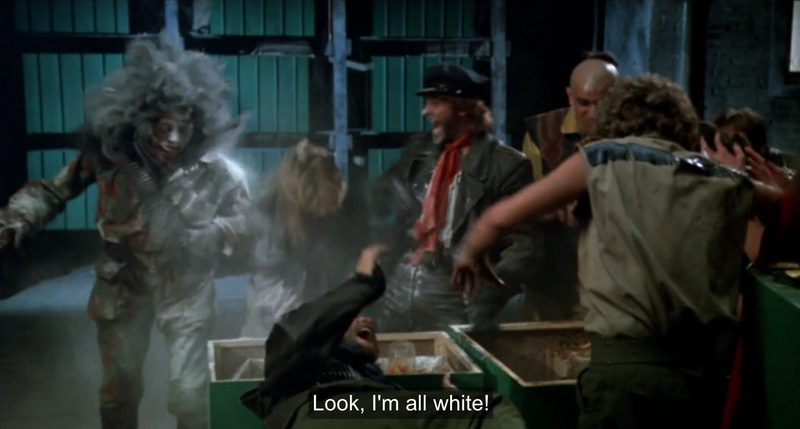 Chocolate, one of the survivors, feels the need to explain something to the gas masked men. "Once, someone told me they read in a book that we all lived on the earth together, that we were all brothers. The book was called the Bible, and it said that God created man and animals." The final twist is then revealed. If you wish to avoid a spoiler, I beg you to turn away now, and not view the image below, or read the text that follows. You have been warned. The men from underground are in fact mutants with rats' faces. 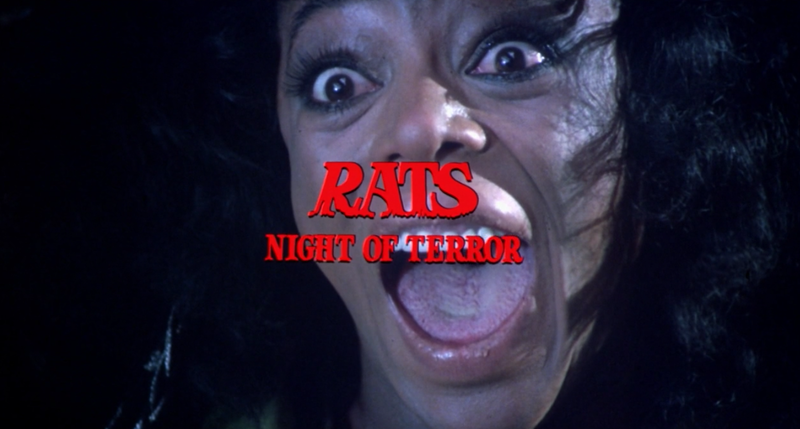 The only possible response is to scream, as Chocolate does, and perhaps afterward to wonder why the gas masked rats were so intent on driving away the smaller rats with gas--but that would be a question that could only be answered by a sequel. Alas, such a sequel was never meant to be. "What you need is some guts. It's no good hanging around in here griping. Let's go outside and come to grips with those rats." "This is the fall of our popular leader, if I'm any judge at all." "Damn it, the revolting creatures are everywhere!" "Myrna, I want to have a word with you." 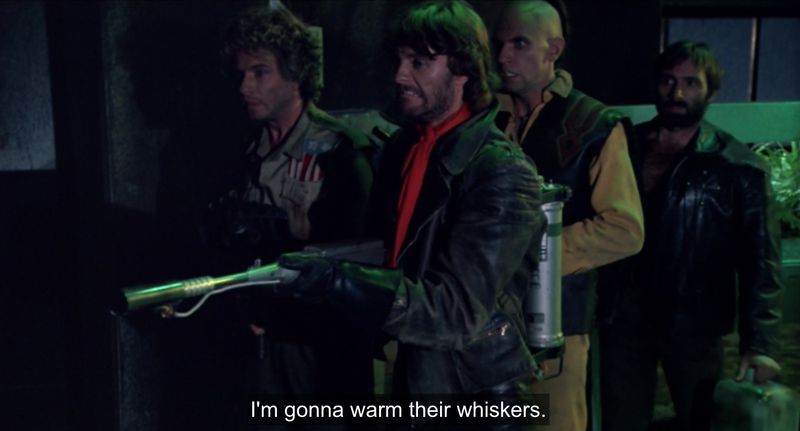 It is no surprise the screenplay was written by frequent Bruno Mattei collaborator Claudio Fragasso, writer/director of Beyond Darkness, among many other high-quality films. The scenario of Rats: Night of Terror is unique as well. As the opening narration explains, the film is a clever reversal on H. G. Wells' The Time Machine, in which the evil Morlocks live underground while the good Eloi live above ground. 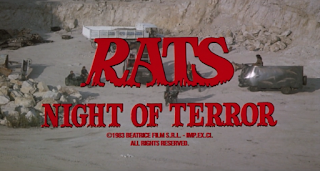 In Rats: Night of Terror, the second human race is said to live underground, while the area above ground is a primitive wasteland. 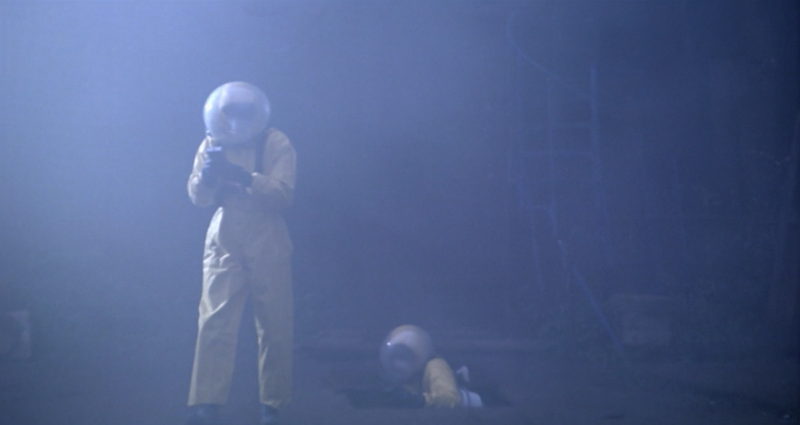 After the opening narration, it is unclear which humans are which, as some humans have returned above ground, and in fact the end implies the humans below ground are not so technologically advanced, but the clarity of the situation is only slightly impeded by these occurrences. On top of such virtuoso displays of filmmaking skill, the film also flirts with minimalism in some clever ways. 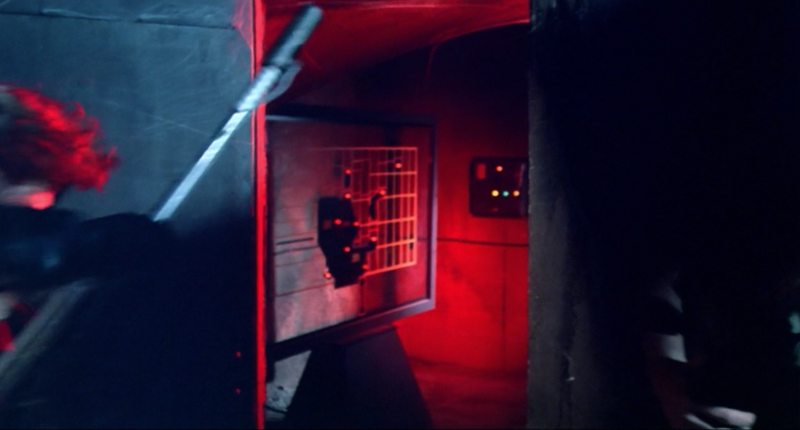 For example, in many shots, the characters are desperately afraid of nearby rats attacking them, but rats are not visible in the frame. Through this ingenious device, director Mattei and his collaborators impress upon the viewer that fear can come from anywhere, even where there are clearly no rates. 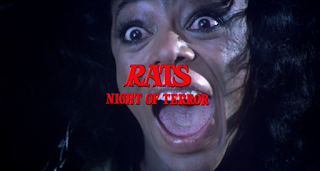 The audience feels the existential dread that Mattei's doomed characters feel, which is one of the most powerful and lasting effects of his masterpiece, Rats: Night of Terror.